Transmission Repair and Replacement - Parker Automotive Inc.
Parker Automotive’s certified technicians provide transmission repair or transmission replacement. 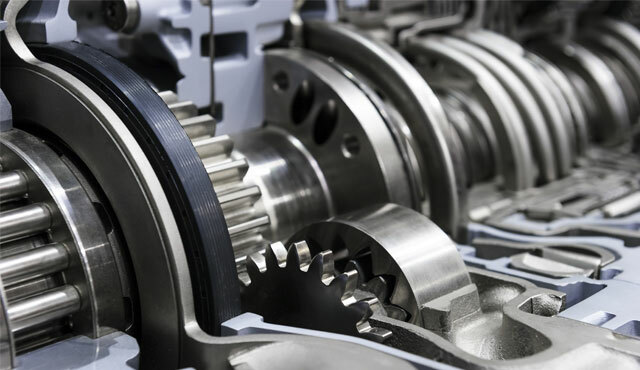 In your vehicle, the transmission connects the engine and the drive wheels and is responsible for carrying power from the former to the latter. Cars have an optimum RPM (revolutions per minute) range at which they perform the best and the transmission has to deliver power to your wheels while maintaining the optimal RPM range in the engine. This is done throughout various different gear combinations. For example, while your car is in first gear the engine is running much faster than the drive wheels, but when you move up through the gears the engine slows even although you are reaching higher speeds. Not only are there multiple different forward moving gears, but the transmission also has neutral and reverse gears to contend with! In neutral the transmission will disconnect the engine and drive wheels so that no power is fed to them while in reverse, the transmission signals the wheels to turn in the opposite direction. Lastly, the park position acts almost like a deadbolt, no power is sent to the wheels by the transmission and they are locked in position. However, the latch responsible for this is very small and has been known to fail, which is why most drivers will also engage the emergency brake while in park. There are two different types of transmission and the one your vehicle uses depends on whether it is front or rear wheel drive. If your vehicle has rear wheel drive, then the transmission is commonly located behind the engine and you may have noticed a ‘hump’ in the center of the vehicle’s floor! The transmission is connected to the rear axle by way of a drive shaft so that power can be sent from the engine to the real wheels. The flow if this power is pretty straightforward, traveling from the engine via a torque converter before being carried to the final drive by the transmission and drive shaft. At this stage it is equally split between the two rear wheels. If you are driving a front wheel drive vehicle, then the set up is slightly different. In most cases the transmission and final drive are combined into what is known as a transaxle. The engine sits sideways under the hood of the car and the transaxle beneath it.